Don was born Dieu DonnÃ Montoucet, October 5, 1925 in Scott, LA., the only son of Jacques and Leona Thomas Montoucet. By age five, Don was playing his dad's accordion with his mother's guidance. His father and mother played the accordion, so it is little wonder that he grew up playing Cajun music with some of the greatest Cajun musicians of his time. Don always welcomes visitors to his home and business and proudly displays the certificate proclaiming his father, Jacques, as the Champion Accordion Player of 1921. It was at Romero's Dance Hall, in Duson, that his father, Jacques Montoucet, defeated the immortal Joe Falcon and Amedee Breaux for the prestigious honor of the best accordion player in South Louisiana. In 1968, when the great Cajun musician Lawrence Walker passed away, Montoucet was asked to fill in for Walker in the band. 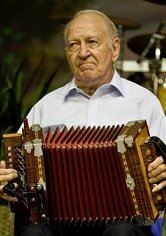 At first, he was not interested, but Lionell Leleux changed his mind and Montoucet was suddenly the lead accordion player in one of South Louisiana's all time popular dance hall bands. He changed the name of the band to "Don Montoucet and the Wandering Aces." When they became regulars at the newly established Mulates Restaurant, he changed the name to the "Mulate Playboys." Since then he has played with the biggest Cajun musicians, such as Lionell Leleux, D.L. Menard, Dewey Balfa, Marc Savoy, Johnny Allen, and many more. Playing Cajun music has taken Moutoucet to places like Washington, D.C., where he played for the 1976 Bicentennial Celebration. In 1978, he performed in France and made seven trips to Canada playing his Cajun music. He also performed in New York, Seattle, and the World's Fair in New Orleans. He has performed at the New Orleans Jazz Festival and Festivals' Acadiens in Lafayette. However, his most memorable voyage occurred in 1988, when Montoucet was invited to travel to Russia and performed his accordion magic for the Peace Summit meeting between former United States President, Richard Nixon, and the former U.S.S.R. President, Mikhail Gorbachev. Don is a retired Lafayette Parish school bus driver and mechanic, where he was employed for thirty years. As a hobby, Montoucet makes and sells the popular T-Fere's that he builds by hand, using only metal from antique hay rakes. He also builds and sells handcrafted accordion clocks. His biggest achievement in life has been his encouragement to young musicians to learn to play the accordion and to preserve the Cajun culture. Some of his more successful students are Kevin Naquin, Steve Riley, File' and Les Freres Michot. There is a very special relationship between Kevin Naquin and Don Montoucet, in that Montoucet and his wife baby-sat Kevin Naquin as a child and first introduced, the now impressive and stirring, Kevin Naquin, to Cajun music and to the French language.